"Bohr" redirects here. For other uses, see Bohr (disambiguation). Bohr founded the Institute of Theoretical Physics at the University of Copenhagen, now known as the Niels Bohr Institute, which opened in 1920. Bohr mentored and collaborated with physicists including Hans Kramers, Oskar Klein, George de Hevesy, and Werner Heisenberg. He predicted the existence of a new zirconium-like element, which was named hafnium, after the Latin name for Copenhagen, where it was discovered. Later, the element bohrium was named after him. During the 1930s, Bohr helped refugees from Nazism. After Denmark was occupied by the Germans, he had a famous meeting with Heisenberg, who had become the head of the German nuclear weapon project. In September 1943, word reached Bohr that he was about to be arrested by the Germans, and he fled to Sweden. From there, he was flown to Britain, where he joined the British Tube Alloys nuclear weapons project, and was part of the British mission to the Manhattan Project. After the war, Bohr called for international cooperation on nuclear energy. He was involved with the establishment of CERN and the Research Establishment Risø of the Danish Atomic Energy Commission and became the first chairman of the Nordic Institute for Theoretical Physics in 1957. Bohr was born in Copenhagen, Denmark, on 7 October 1885, the second of three children of Christian Bohr, a professor of physiology at the University of Copenhagen, and Ellen Adler Bohr, who came from a wealthy Danish Jewish family prominent in banking and parliamentary circles. He had an elder sister, Jenny, and a younger brother Harald. Jenny became a teacher, while Harald became a mathematician and Olympic footballer who played for the Danish national team at the 1908 Summer Olympics in London. Bohr was a passionate footballer as well, and the two brothers played several matches for the Copenhagen-based Akademisk Boldklub (Academic Football Club), with Bohr as goalkeeper. Bohr was educated at Gammelholm Latin School, starting when he was seven. In 1903, Bohr enrolled as an undergraduate at Copenhagen University. His major was physics, which he studied under Professor Christian Christiansen, the university's only professor of physics at that time. He also studied astronomy and mathematics under Professor Thorvald Thiele, and philosophy under Professor Harald Høffding, a friend of his father. In 1905, a gold medal competition was sponsored by the Royal Danish Academy of Sciences and Letters to investigate a method for measuring the surface tension of liquids that had been proposed by Lord Rayleigh in 1879. This involved measuring the frequency of oscillation of the radius of a water jet. Bohr conducted a series of experiments using his father's laboratory in the university; the university itself had no physics laboratory. To complete his experiments, he had to make his own glassware, creating test tubes with the required elliptical cross-sections. He went beyond the original task, incorporating improvements into both Rayleigh's theory and his method, by taking into account the viscosity of the water, and by working with finite amplitudes instead of just infinitesimal ones. His essay, which he submitted at the last minute, won the prize. He later submitted an improved version of the paper to the Royal Society in London for publication in the Philosophical Transactions of the Royal Society. Harald became the first of the two Bohr brothers to earn a master's degree, which he earned for mathematics in April 1909. Niels took another nine months to earn his. Students had to submit a thesis on a subject assigned by their supervisor. Bohr's supervisor was Christiansen, and the topic he chose was the electron theory of metals. Bohr subsequently elaborated his master's thesis into his much-larger Doctor of Philosophy (dr. phil.) thesis. He surveyed the literature on the subject, settling on a model postulated by Paul Drude and elaborated by Hendrik Lorentz, in which the electrons in a metal are considered to behave like a gas. Bohr extended Lorentz's model, but was still unable to account for phenomena like the Hall effect, and concluded that electron theory could not fully explain the magnetic properties of metals. The thesis was accepted in April 1911, and Bohr conducted his formal defence on 13 May. Harald had received his doctorate the previous year. 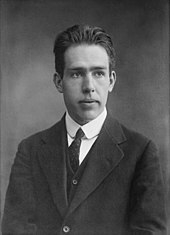 Bohr's thesis was groundbreaking, but attracted little interest outside Scandinavia because it was written in Danish, a Copenhagen University requirement at the time. In 1921, the Dutch physicist Hendrika Johanna van Leeuwen would independently derive a theorem from Bohr's thesis that is today known as the Bohr–van Leeuwen theorem. In 1910, Bohr met Margrethe Nørlund, the sister of the mathematician Niels Erik Nørlund. Bohr resigned his membership in the Church of Denmark on 16 April 1912, and he and Margrethe were married in a civil ceremony at the town hall in Slagelse on 1 August. Years later, his brother Harald similarly left the church before getting married. Bohr and Margrethe had six sons. The oldest, Christian, died in a boating accident in 1934, and another, Harald, died from childhood meningitis. Aage Bohr became a successful physicist, and in 1975 was awarded the Nobel Prize in physics, like his father. Hans Bohr [da] became a physician; Erik Bohr [da], a chemical engineer; and Ernest, a lawyer. Like his uncle Harald, Ernest Bohr became an Olympic athlete, playing field hockey for Denmark at the 1948 Summer Olympics in London. In September 1911, Bohr, supported by a fellowship from the Carlsberg Foundation, travelled to England. At the time, it was where most of the theoretical work on the structure of atoms and molecules was being done. He met J. J. Thomson of the Cavendish Laboratory and Trinity College, Cambridge. He attended lectures on electromagnetism given by James Jeans and Joseph Larmor, and did some research on cathode rays, but failed to impress Thomson. He had more success with younger physicists like the Australian William Lawrence Bragg, and New Zealand's Ernest Rutherford, whose 1911 small central nucleus Rutherford model of the atom had challenged Thomson's 1904 plum pudding model. Bohr received an invitation from Rutherford to conduct post-doctoral work at Victoria University of Manchester, where Bohr met George de Hevesy and Charles Galton Darwin (whom Bohr referred to as "the grandson of the real Darwin"). 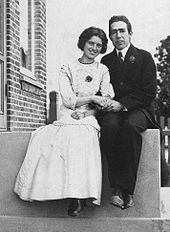 Bohr returned to Denmark in July 1912 for his wedding, and travelled around England and Scotland on his honeymoon. On his return, he became a privatdocent at the University of Copenhagen, giving lectures on thermodynamics. Martin Knudsen put Bohr's name forward for a docent, which was approved in July 1913, and Bohr then began teaching medical students. His three papers, which later became famous as "the trilogy", were published in Philosophical Magazine in July, September and November of that year. He adapted Rutherford's nuclear structure to Max Planck's quantum theory and so created his Bohr model of the atom. Planetary models of atoms were not new, but Bohr's treatment was. Taking the 1912 paper by Darwin on the role of electrons in the interaction of alpha particles with a nucleus as his starting point, he advanced the theory of electrons travelling in orbits around the atom's nucleus, with the chemical properties of each element being largely determined by the number of electrons in the outer orbits of its atoms. He introduced the idea that an electron could drop from a higher-energy orbit to a lower one, in the process emitting a quantum of discrete energy. This became a basis for what is now known as the old quantum theory. The Bohr model of the hydrogen atom. A negatively charged electron, confined to an atomic orbital, orbits a small, positively charged nucleus; a quantum jump between orbits is accompanied by an emitted or absorbed amount of electromagnetic radiation. where me is the electron's mass, e is its charge, h is Planck's constant and Z is the atom's atomic number (1 for hydrogen). The model's first hurdle was the Pickering series, lines which did not fit Balmer's formula. When challenged on this by Alfred Fowler, Bohr replied that they were caused by ionised helium, helium atoms with only one electron. The Bohr model was found to work for such ions. Many older physicists, like Thomson, Rayleigh and Hendrik Lorentz, did not like the trilogy, but the younger generation, including Rutherford, David Hilbert, Albert Einstein, Enrico Fermi, Max Born and Arnold Sommerfeld saw it as a breakthrough. The trilogy's acceptance was entirely due to its ability to explain phenomena which stymied other models, and to predict results that were subsequently verified by experiments. Today, the Bohr model of the atom has been superseded, but is still the best known model of the atom, as it often appears in high school physics and chemistry texts. Bohr did not enjoy teaching medical students. He decided to return to Manchester, where Rutherford had offered him a job as a reader in place of Darwin, whose tenure had expired. Bohr accepted. He took a leave of absence from the University of Copenhagen, which he started by taking a holiday in Tyrol with his brother Harald and aunt Hanna Adler. There, he visited the University of Göttingen and the Ludwig Maximilian University of Munich, where he met Sommerfeld and conducted seminars on the trilogy. The First World War broke out while they were in Tyrol, greatly complicating the trip back to Denmark and Bohr's subsequent voyage with Margrethe to England, where he arrived in October 1914. They stayed until July 1916, by which time he had been appointed to the Chair of Theoretical Physics at the University of Copenhagen, a position created especially for him. His docentship was abolished at the same time, so he still had to teach physics to medical students. New professors were formally introduced to King Christian X, who expressed his delight at meeting such a famous football player. In April 1917, Bohr began a campaign to establish an Institute of Theoretical Physics. He gained the support of the Danish government and the Carlsberg Foundation, and sizeable contributions were also made by industry and private donors, many of them Jewish. Legislation establishing the Institute was passed in November 1918. Now known as the Niels Bohr Institute, it opened on 3 March 1921, with Bohr as its director. His family moved into an apartment on the first floor. Bohr's institute served as a focal point for researchers into quantum mechanics and related subjects in the 1920s and 1930s, when most of the world's best known theoretical physicists spent some time in his company. Early arrivals included Hans Kramers from the Netherlands, Oskar Klein from Sweden, George de Hevesy from Hungary, Wojciech Rubinowicz from Poland and Svein Rosseland from Norway. Bohr became widely appreciated as their congenial host and eminent colleague. Klein and Rosseland produced the Institute's first publication even before it opened. The Bohr model worked well for hydrogen, but could not explain more complex elements. By 1919, Bohr was moving away from the idea that electrons orbited the nucleus and developed heuristics to describe them. The rare-earth elements posed a particular classification problem for chemists, because they were so chemically similar. An important development came in 1924 with Wolfgang Pauli's discovery of the Pauli exclusion principle, which put Bohr's models on a firm theoretical footing. Bohr was then able to declare that the as-yet-undiscovered element 72 was not a rare-earth element, but an element with chemical properties similar to those of zirconium. He was immediately challenged by the French chemist Georges Urbain, who claimed to have discovered a rare-earth element 72, which he called "celtium". At the Institute in Copenhagen, Dirk Coster and George de Hevesy took up the challenge of proving Bohr right and Urbain wrong. Starting with a clear idea of the chemical properties of the unknown element greatly simplified the search process. They went through samples from Copenhagen's Museum of Mineralogy looking for a zirconium-like element and soon found it. The element, which they named hafnium (Hafnia being the Latin name for Copenhagen) turned out to be more common than gold. 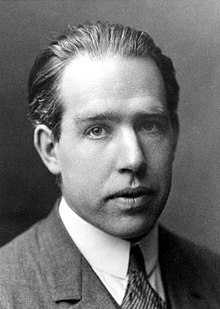 In 1922, Bohr was awarded the Nobel Prize in Physics "for his services in the investigation of the structure of atoms and of the radiation emanating from them". The award thus recognised both the Trilogy and his early leading work in the emerging field of quantum mechanics. For his Nobel lecture, Bohr gave his audience a comprehensive survey of what was then known about the structure of the atom, including the correspondence principle, which he had formulated. This states that the behaviour of systems described by quantum theory reproduces classical physics in the limit of large quantum numbers. The discovery of Compton scattering by Arthur Holly Compton in 1923 convinced most physicists that light was composed of photons, and that energy and momentum were conserved in collisions between electrons and photons. 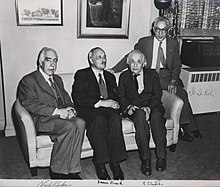 In 1924, Bohr, Kramers and John C. Slater, an American physicist working at the Institute in Copenhagen, proposed the Bohr–Kramers–Slater theory (BKS). It was more a programme than a full physical theory, as the ideas it developed were not worked out quantitatively. BKS theory became the final attempt at understanding the interaction of matter and electromagnetic radiation on the basis of the old quantum theory, in which quantum phenomena were treated by imposing quantum restrictions on a classical wave description of the electromagnetic field. Modelling atomic behaviour under incident electromagnetic radiation using "virtual oscillators" at the absorption and emission frequencies, rather than the (different) apparent frequencies of the Bohr orbits, led Max Born, Werner Heisenberg and Kramers to explore different mathematical models. They led to the development of matrix mechanics, the first form of modern quantum mechanics. The BKS theory also generated discussion of, and renewed attention to, difficulties in the foundations of the old quantum theory. The most provocative element of BKS – that momentum and energy would not necessarily be conserved in each interaction, but only statistically – was soon shown to be in conflict with experiments conducted by Walther Bothe and Hans Geiger. In light of these results, Bohr informed Darwin that "there is nothing else to do than to give our revolutionary efforts as honourable a funeral as possible". The introduction of spin by George Uhlenbeck and Samuel Goudsmit in November 1925 was a milestone. The next month, Bohr travelled to Leiden to attend celebrations of the 50th anniversary of Hendrick Lorentz receiving his doctorate. When his train stopped in Hamburg, he was met by Wolfgang Pauli and Otto Stern, who asked for his opinion of the spin theory. 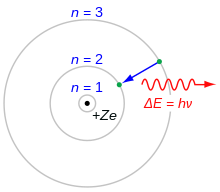 Bohr pointed out that he had concerns about the interaction between electrons and magnetic fields. When he arrived in Leiden, Paul Ehrenfest and Albert Einstein informed Bohr that Einstein had resolved this problem using relativity. Bohr then had Uhlenbeck and Goudsmit incorporate this into their paper. Thus, when he met Werner Heisenberg and Pascual Jordan in Göttingen on the way back, he had become, in his own words, "a prophet of the electron magnet gospel". 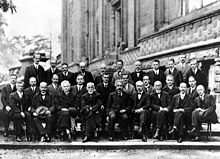 1927 Solvay Conference in Brussels, October 1927. Bohr is on the right in the middle row, next to Max Born. Heisenberg first came to Copenhagen in 1924, then returned to Göttingen in June 1925, shortly thereafter developing the mathematical foundations of quantum mechanics. When he showed his results to Max Born in Göttingen, Born realised that they could best be expressed using matrices. This work attracted the attention of the British physicist Paul Dirac, who came to Copenhagen for six months in September 1926. Austrian physicist Erwin Schrödinger also visited in 1926. His attempt at explaining quantum physics in classical terms using wave mechanics impressed Bohr, who believed it contributed "so much to mathematical clarity and simplicity that it represents a gigantic advance over all previous forms of quantum mechanics". When Kramers left the Institute in 1926 to take up a chair as professor of theoretical physics at the Utrecht University, Bohr arranged for Heisenberg to return and take Kramers's place as a lektor at the University of Copenhagen. Heisenberg worked in Copenhagen as a university lecturer and assistant to Bohr from 1926 to 1927. Bohr became convinced that light behaved like both waves and particles, and in 1927, experiments confirmed the de Broglie hypothesis that matter (like electrons) also behaved like waves. He conceived the philosophical principle of complementarity: that items could have apparently mutually exclusive properties, such as being a wave or a stream of particles, depending on the experimental framework. He felt that it was not fully understood by professional philosophers. In Copenhagen in 1927 Heisenberg developed his uncertainty principle, which Bohr embraced. In a paper he presented at the Volta Conference at Como in September 1927, he demonstrated that the uncertainty principle could be derived from classical arguments, without quantum terminology or matrices. Einstein preferred the determinism of classical physics over the probabilistic new quantum physics to which he himself had contributed. Philosophical issues that arose from the novel aspects of quantum mechanics became widely celebrated subjects of discussion. Einstein and Bohr had good-natured arguments over such issues throughout their lives. In 1914, Carl Jacobsen, the heir to Carlsberg breweries, bequeathed his mansion to be used for life by the Dane who had made the most prominent contribution to science, literature or the arts, as an honorary residence (Danish: Æresbolig). Harald Høffding had been the first occupant, and upon his death in July 1931, the Royal Danish Academy of Sciences and Letters gave Bohr occupancy. He and his family moved there in 1932. He was elected president of the Academy on 17 March 1939. By 1929, the phenomenon of beta decay prompted Bohr to again suggest that the law of conservation of energy be abandoned, but Enrico Fermi's hypothetical neutrino and the subsequent 1932 discovery of the neutron provided another explanation. This prompted Bohr to create a new theory of the compound nucleus in 1936, which explained how neutrons could be captured by the nucleus. In this model, the nucleus could be deformed like a drop of liquid. He worked on this with a new collaborator, the Danish physicist Fritz Kalckar, who died suddenly in 1938. The discovery of nuclear fission by Otto Hahn in December 1938 (and its theoretical explanation by Lise Meitner) generated intense interest among physicists. Bohr brought the news to the United States where he opened the Fifth Washington Conference on Theoretical Physics with Fermi on 26 January 1939. When Bohr told George Placzek that this resolved all the mysteries of transuranic elements, Placzek told him that one remained: the neutron capture energies of uranium did not match those of its decay. Bohr thought about it for a few minutes and then announced to Placzek, Léon Rosenfeld and John Wheeler that "I have understood everything." Based on his liquid drop model of the nucleus, Bohr concluded that it was the uranium-235 isotope and not the more abundant uranium-238 that was primarily responsible for fission with thermal neutrons. In April 1940, John R. Dunning demonstrated that Bohr was correct. In the meantime, Bohr and Wheeler developed a theoretical treatment which they published in a September 1939 paper on "The Mechanism of Nuclear Fission". Bohr read the 19th-century Danish Christian existentialist philosopher, Søren Kierkegaard. Richard Rhodes argued in The Making of the Atomic Bomb that Bohr was influenced by Kierkegaard through Høffding. In 1909, Bohr sent his brother Kierkegaard's Stages on Life's Way as a birthday gift. In the enclosed letter, Bohr wrote, "It is the only thing I have to send home; but I do not believe that it would be very easy to find anything better ... I even think it is one of the most delightful things I have ever read." Bohr enjoyed Kierkegaard's language and literary style, but mentioned that he had some disagreement with Kierkegaard's philosophy. Some of Bohr's biographers suggested that this disagreement stemmed from Kierkegaard's advocacy of Christianity, while Bohr was an atheist. There has been some dispute over the extent to which Kierkegaard influenced Bohr's philosophy and science. David Favrholdt argued that Kierkegaard had minimal influence over Bohr's work, taking Bohr's statement about disagreeing with Kierkegaard at face value, while Jan Faye argued that one can disagree with the content of a theory while accepting its general premises and structure. The rise of Nazism in Germany prompted many scholars to flee their countries, either because they were Jewish or because they were political opponents of the Nazi regime. In 1933, the Rockefeller Foundation created a fund to help support refugee academics, and Bohr discussed this programme with the President of the Rockefeller Foundation, Max Mason, in May 1933 during a visit to the United States. Bohr offered the refugees temporary jobs at the Institute, provided them with financial support, arranged for them to be awarded fellowships from the Rockefeller Foundation, and ultimately found them places at institutions around the world. Those that he helped included Guido Beck, Felix Bloch, James Franck, George de Hevesy, Otto Frisch, Hilde Levi, Lise Meitner, George Placzek, Eugene Rabinowitch, Stefan Rozental, Erich Ernst Schneider, Edward Teller, Arthur von Hippel and Victor Weisskopf. In April 1940, early in the Second World War, Nazi Germany invaded and occupied Denmark. To prevent the Germans from discovering Max von Laue's and James Franck's gold Nobel medals, Bohr had de Hevesy dissolve them in aqua regia. In this form, they were stored on a shelf at the Institute until after the war, when the gold was precipitated and the medals re-struck by the Nobel Foundation. Bohr kept the Institute running, but all the foreign scholars departed. Bohr was aware of the possibility of using uranium-235 to construct an atomic bomb, referring to it in lectures in Britain and Denmark shortly before and after the war started, but he did not believe that it was technically feasible to extract a sufficient quantity of uranium-235. In September 1941, Heisenberg, who had become head of the German nuclear energy project, visited Bohr in Copenhagen. During this meeting the two men took a private moment outside, the content of which has caused much speculation, as both gave differing accounts. According to Heisenberg, he began to address nuclear energy, morality and the war, to which Bohr seems to have reacted by terminating the conversation abruptly while not giving Heisenberg hints about his own opinions. Ivan Supek, one of Heisenberg's students and friends, claimed that the main subject of the meeting was Carl Friedrich von Weizsäcker, who had proposed trying to persuade Bohr to mediate peace between Britain and Germany. In 1957, Heisenberg wrote to Robert Jungk, who was then working on the book Brighter than a Thousand Suns: A Personal History of the Atomic Scientists. Heisenberg explained that he had visited Copenhagen to communicate to Bohr the views of several German scientists, that production of a nuclear weapon was possible with great efforts, and this raised enormous responsibilities on the world's scientists on both sides. When Bohr saw Jungk's depiction in the Danish translation of the book, he drafted (but never sent) a letter to Heisenberg, stating that he never understood the purpose of Heisenberg's visit, was shocked by Heisenberg's opinion that Germany would win the war, and that atomic weapons could be decisive. Michael Frayn's 1998 play Copenhagen explores what might have happened at the 1941 meeting between Heisenberg and Bohr. A BBC television film version of the play was first screened on 26 September 2002, with Stephen Rea as Bohr, and Daniel Craig as Heisenberg. The same meeting had previously been dramatised by the BBC's Horizon science documentary series in 1992, with Anthony Bate as Bohr, and Philip Anthony as Heisenberg. The meeting is also dramatized in the Norwegian/Danish/British miniseries The Heavy Water War. In September 1943, word reached Bohr and his brother Harald that the Nazis considered their family to be Jewish, since their mother was Jewish, and that they were therefore in danger of being arrested. The Danish resistance helped Bohr and his wife escape by sea to Sweden on 29 September. The next day, Bohr persuaded King Gustaf V of Sweden to make public Sweden's willingness to provide asylum to Jewish refugees. On 2 October 1943, Swedish radio broadcast that Sweden was ready to offer asylum, and the mass rescue of the Danish Jews by their countrymen followed swiftly thereafter. Some historians claim that Bohr's actions led directly to the mass rescue, while others say that, though Bohr did all that he could for his countrymen, his actions were not a decisive influence on the wider events. Eventually, over 7,000 Danish Jews escaped to Sweden. When the news of Bohr's escape reached Britain, Lord Cherwell sent a telegram to Bohr asking him to come to Britain. Bohr arrived in Scotland on 6 October in a de Havilland Mosquito operated by the British Overseas Airways Corporation (BOAC). The Mosquitos were unarmed high-speed bomber aircraft that had been converted to carry small, valuable cargoes or important passengers. By flying at high speed and high altitude, they could cross German-occupied Norway, and yet avoid German fighters. Bohr, equipped with parachute, flying suit and oxygen mask, spent the three-hour flight lying on a mattress in the aircraft's bomb bay. During the flight, Bohr did not wear his flying helmet as it was too small, and consequently did not hear the pilot's intercom instruction to turn on his oxygen supply when the aircraft climbed to high altitude to overfly Norway. He passed out from oxygen starvation and only revived when the aircraft descended to lower altitude over the North Sea. Bohr's son Aage followed his father to Britain on another flight a week later, and became his personal assistant. Bohr was warmly received by James Chadwick and Sir John Anderson, but for security reasons Bohr was kept out of sight. He was given an apartment at St James's Palace and an office with the British Tube Alloys nuclear weapons development team. Bohr was astonished at the amount of progress that had been made. Chadwick arranged for Bohr to visit the United States as a Tube Alloys consultant, with Aage as his assistant. On 8 December 1943, Bohr arrived in Washington, D.C., where he met with the director of the Manhattan Project, Brigadier General Leslie R. Groves, Jr. He visited Einstein and Pauli at the Institute for Advanced Study in Princeton, New Jersey, and went to Los Alamos in New Mexico, where the nuclear weapons were being designed. For security reasons, he went under the name of "Nicholas Baker" in the United States, while Aage became "James Baker". 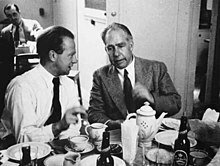 In May 1944 the Danish resistance newspaper De frie Danske reported that they had learned that 'the famous son of Denmark Professor Niels Bohr' in October the previous year had fled his country via Sweden to London and from there travelled to Moscow from where he could be assumed to support the war effort. Bohr did not remain at Los Alamos, but paid a series of extended visits over the course of the next two years. Robert Oppenheimer credited Bohr with acting "as a scientific father figure to the younger men", most notably Richard Feynman. Bohr is quoted as saying, "They didn't need my help in making the atom bomb." Oppenheimer gave Bohr credit for an important contribution to the work on modulated neutron initiators. "This device remained a stubborn puzzle," Oppenheimer noted, "but in early February 1945 Niels Bohr clarified what had to be done." Bohr recognised early that nuclear weapons would change international relations. In April 1944, he received a letter from Peter Kapitza, written some months before when Bohr was in Sweden, inviting him to come to the Soviet Union. The letter convinced Bohr that the Soviets were aware of the Anglo-American project, and would strive to catch up. He sent Kapitza a non-committal response, which he showed to the authorities in Britain before posting. Bohr met Churchill on 16 May 1944, but found that "we did not speak the same language". Churchill disagreed with the idea of openness towards the Russians to the point that he wrote in a letter: "It seems to me Bohr ought to be confined or at any rate made to see that he is very near the edge of mortal crimes." Oppenheimer suggested that Bohr visit President Franklin D. Roosevelt to convince him that the Manhattan Project should be shared with the Soviets in the hope of speeding up its results. Bohr's friend, Supreme Court Justice Felix Frankfurter, informed President Roosevelt about Bohr's opinions, and a meeting between them took place on 26 August 1944. Roosevelt suggested that Bohr return to the United Kingdom to try to win British approval. When Churchill and Roosevelt met at Hyde Park on 19 September 1944, they rejected the idea of informing the world about the project, and the aide-mémoire of their conversation contained a rider that "enquiries should be made regarding the activities of Professor Bohr and steps taken to ensure that he is responsible for no leakage of information, particularly to the Russians". In June 1950, Bohr addressed an "Open Letter" to the United Nations calling for international cooperation on nuclear energy. In the 1950s, after the Soviet Union's first nuclear weapon test, the International Atomic Energy Agency was created along the lines of Bohr's suggestion. In 1957 he received the first ever Atoms for Peace Award. With the war now ended, Bohr returned to Copenhagen on 25 August 1945, and was re-elected President of the Royal Danish Academy of Arts and Sciences on 21 September. At a memorial meeting of the Academy on 17 October 1947 for King Christian X, who had died in April, the new king, Frederick IX, announced that he was conferring the Order of the Elephant on Bohr. This award was normally awarded only to royalty and heads of state, but the king said that it honoured not just Bohr personally, but Danish science. 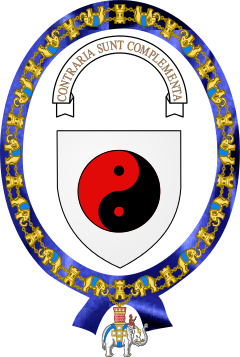 Bohr designed his own coat of arms which featured a taijitu (symbol of yin and yang) and a motto in Latin: contraria sunt complementa, "opposites are complementary". The Second World War demonstrated that science, and physics in particular, now required considerable financial and material resources. To avoid a brain drain to the United States, twelve European countries banded together to create CERN, a research organisation along the lines of the national laboratories in the United States, designed to undertake Big Science projects beyond the resources of any one of them alone. Questions soon arose regarding the best location for the facilities. Bohr and Kramers felt that the Institute in Copenhagen would be the ideal site. Pierre Auger, who organised the preliminary discussions, disagreed; he felt that both Bohr and his Institute were past their prime, and that Bohr's presence would overshadow others. After a long debate, Bohr pledged his support to CERN in February 1952, and Geneva was chosen as the site in October. The CERN Theory Group was based in Copenhagen until their new accommodation in Geneva was ready in 1957. Victor Weisskopf, who later became the Director General of CERN, summed up Bohr's role, saying that "there were other personalities who started and conceived the idea of CERN. The enthusiasm and ideas of the other people would not have been enough, however, if a man of his stature had not supported it." Meanwhile, Scandinavian countries formed the Nordic Institute for Theoretical Physics in 1957, with Bohr as its chairman. He was also involved with the founding of the Research Establishment Risø of the Danish Atomic Energy Commission, and served as its first chairman from February 1956. Bohr died of heart failure at his home in Carlsberg on 18 November 1962. He was cremated, and his ashes were buried in the family plot in the Assistens Cemetery in the Nørrebro section of Copenhagen, along with those of his parents, his brother Harald, and his son Christian. Years later, his wife's ashes were also interred there. On 7 October 1965, on what would have been his 80th birthday, the Institute for Theoretical Physics at the University of Copenhagen was officially renamed to what it had been called unofficially for many years: the Niels Bohr Institute.
. Several other countries have also issued postage stamps depicting Bohr. In 1997, the Danish National Bank began circulating the 500-krone banknote with the portrait of Bohr smoking a pipe. An asteroid, 3948 Bohr, was named after him, as was the Bohr lunar crater and bohrium, the chemical element with atomic number 107. Bohr, Niels (2008). Nielsen, J. Rud, ed. Volume 1: Early Work (1905–1911). Niels Bohr Collected Works. Amsterdam: Elsevier. ISBN 978-0-444-53286-2. OCLC 272382249. —— (2008). Hoyer, Ulrich, ed. Volume 2: Work on Atomic Physics (1912–1917). Niels Bohr Collected Works. Amsterdam: Elsevier. ISBN 978-0-444-53286-2. OCLC 272382249. —— (2008). Nielsen, J. Rud, ed. Volume 3: The Correspondence Principle (1918–1923). Niels Bohr Collected Works. Amsterdam: Elsevier. ISBN 978-0-444-53286-2. OCLC 272382249. —— (2008). Nielsen, J. Rud, ed. Volume 4: The Periodic System (1920–1923). Niels Bohr Collected Works. Amsterdam: Elsevier. ISBN 978-0-444-53286-2. OCLC 272382249. —— (2008). Stolzenburg, Klaus, ed. Volume 5: The Emergence of Quantum Mechanics (mainly 1924–1926). Niels Bohr Collected Works. Amsterdam: Elsevier. ISBN 978-0-444-53286-2. OCLC 272382249. —— (2008). Kalckar, Jørgen, ed. Volume 6: Foundations of Quantum Physics I (1926–1932). Niels Bohr Collected Works. Amsterdam: Elsevier. ISBN 978-0-444-53286-2. OCLC 272382249. —— (2008). Kalckar, Jørgen, ed. Volume 7: Foundations of Quantum Physics I (1933–1958). Niels Bohr Collected Works. Amsterdam: Elsevier. ISBN 978-0-444-53286-2. OCLC 272382249. —— (2008). Thorsen, Jens, ed. Volume 8: The Penetration of Charged Particles Through Matter (1912–1954). Niels Bohr Collected Works. Amsterdam: Elsevier. ISBN 978-0-444-53286-2. OCLC 272382249. —— (2008). Peierls, Rudolf, ed. Volume 9: Nuclear Physics (1929–1952). Niels Bohr Collected Works. Amsterdam: Elsevier. ISBN 978-0-444-53286-2. OCLC 272382249. —— (2008). Favrholdt, David, ed. Volume 10: Complementarity Beyond Physics (1928–1962). Niels Bohr Collected Works. Amsterdam: Elsevier. ISBN 978-0-444-53286-2. OCLC 272382249. —— (2008). Aaserud, Finn, ed. Volume 11: The Political Arena (1934–1961). Niels Bohr Collected Works. Amsterdam: Elsevier. ISBN 978-0-444-53286-2. OCLC 272382249. —— (2008). Aaserud, Finn, ed. Volume 12: Popularization and People (1911–1962). Niels Bohr Collected Works. Amsterdam: Elsevier. ISBN 978-0-444-53286-2. OCLC 272382249. —— (2008). Aaserud, Finn, ed. Volume 13: Cumulative Subject Index. Niels Bohr Collected Works. Amsterdam: Elsevier. ISBN 978-0-444-53286-2. OCLC 272382249. ^ a b Politiets Registerblade [Register cards of the Police] (in Danish). Copenhagen: Københavns Stadsarkiv. 7 June 1892. Station Dødeblade (indeholder afdøde i perioden). Filmrulle 0002. Registerblad 3341. ID 3308989. Archived from the original on 29 November 2014. ^ a b Pais 1991, pp. 44–45, 538–539. ^ There is no truth in the oft-repeated claim that Bohr emulated his brother, Harald, by playing for the Danish national team. Dart, James (27 July 2005). "Bohr's footballing career". The Guardian. London. Retrieved 26 June 2011. ^ "Niels Bohr's school years". Niels Bohr Institute. Retrieved 14 February 2013. ^ a b "Life as a Student". Niels Bohr Institute. Retrieved 14 February 2013. ^ "Niels Bohr | Danish physicist". Encyclopedia Britannica. Retrieved 2017-08-25. ^ Kragh 2012, pp. 43–45. ^ a b Pais 1991, pp. 226, 249. ^ "Niels Bohr – Biography". Nobelprize.org. Retrieved 10 November 2011. ^ "Ernest Bohr Biography and Olympic Results – Olympics". Sports-Reference.com. Retrieved 12 February 2013. ^ Kragh 2012, p. 46. ^ a b Kennedy 1985, p. 7. ^ Pais 1991, pp. 125–129. ^ a b Bohr, Niels (1913). "On the Constitution of Atoms and Molecules, Part II Systems Containing Only a Single Nucleus" (PDF). Philosophical Magazine. 26 (153): 476–502. doi:10.1080/14786441308634993. ^ Kragh 2012, p. 22. ^ Darwin, Charles Galton (1912). "A theory of the absorption and scattering of the alpha rays". Philosophical Magazine. 23 (138): 901–920. doi:10.1080/14786440608637291. ISSN 1941-5982. ^ Arabatzis, Theodore (2006). Representing Electrons: A Biographical Approach to Theoretical Entities. University of Chicago Press. p. 118. ISBN 978-0-226-02420-2. ^ a b Pais 1991, pp. 146–149. ^ Aaserud, Finn. "History of the institute: The establishment of an institute". Niels Bohr Institute. Archived from the original on 5 April 2008. Retrieved 11 May 2008. ^ a b Pais 1991, pp. 169–171. ^ Bohr, N.; Kramers, H. A.; Slater, J. C. (1924). "The Quantum Theory of Radiation" (PDF). Philosophical Magazine. 6. 76 (287): 785–802. doi:10.1080/14786442408565262. Archived from the original (PDF) on 22 May 2013. Retrieved 18 February 2013. ^ Pais 1991, pp. 272–275. ^ Pais 1991, p. 301. ^ MacKinnon 1985, p. 101. ^ a b Pais 1991, pp. 304–309. ^ Pais 1991, pp. 337–340, 368–370. ^ Bohr, Niels (20 August 1937). "Transmutations of Atomic Nuclei". Science. 86 (2225): 161–165. Bibcode:1937Sci....86..161B. doi:10.1126/science.86.2225.161. PMID 17751630. ^ a b Stuewer 1985, pp. 211–216. ^ a b Faye 1991, p. 37. ^ Aaserud & Heilbron 2013, pp. 159–160: "A statement about religion in the loose notes on Kierkegaard may throw light on the notion of wildness that appears in many of Bohr's letters. 'I, who do not feel in any way united with, and even less, bound to a God, and therefore am also much poorer [than Kierkegaard], would say that the good [is] the overall lofty goal, as only by being good [can one] judge according to worth and right.'" ^ Aaserud & Heilbron 2013, p. 110: "Bohr's sort of humor, use of parables and stories, tolerance, dependence on family, feelings of indebtedness, obligation, and guilt, and his sense of responsibility for science, community, and, ultimately, humankind in general, are common traits of the Jewish intellectual. So too is a well-fortified atheism. Bohr ended with no religious belief and a dislike of all religions that claimed to base their teachings on revelations." ^ Heisenberg 1984, p. 77. ^ Portal Jutarnji.hr (19 March 2006). "Moj život s nobelovcima 20. stoljeća" [My Life with the 20th century Nobel Prizewinners]. Jutarnji list (in Croatian). Retrieved 13 August 2007. Istinu sam saznao od Margrethe, Bohrove supruge. ... Ni Heisenberg ni Bohr nisu bili glavni junaci toga susreta nego Carl Friedrich von Weizsaecker. ... Von Weizsaeckerova ideja, za koju mislim da je bila zamisao njegova oca koji je bio Ribbentropov zamjenik, bila je nagovoriti Nielsa Bohra da posreduje za mir između Velike Britanije i Njemačke. [I learned the truth from Margrethe, Bohr's wife. ... Neither Bohr nor Heisenberg were the main characters of this encounter, but Carl Friedrich von Weizsaecker. Von Weizsaecker's idea, which I think was the brainchild of his father who was Ribbentrop's deputy, was to persuade Niels Bohr to mediate for peace between Great Britain and Germany.] An interview with Ivan Supek relating to the 1941 Bohr – Heisenberg meeting. ^ Heisenberg, Werner. "Letter From Werner Heisenberg to Author Robert Jungk". The Manhattan Project Heritage Preservation Association, Inc. Archived from the original on 17 October 2006. Retrieved 21 December 2006. ^ Aaserud, Finn (6 February 2002). "Release of documents relating to 1941 Bohr-Heisenberg meeting". Niels Bohr Archive. Archived from the original on 2017-02-17. Retrieved 4 June 2007. ^ "Copenhagen – Michael Frayn". The Complete Review. Retrieved 27 February 2013. ^ "The Saboteurs – Episode Guide". Channel 4. Retrieved 3 March 2017. ^ a b Rhodes 1986, pp. 483–484. ^ Stadtler, Morrison & Martin 1995, p. 136. ^ Powers 1993, p. 237. ^ a b Jones 1985, pp. 280–282. ^ Pais 1991, pp. 491. ^ Cockroft 1963, p. 46. ^ "Professor Bohr ankommet til Moskva" [Professor Bohr arrived in Moscow]. De frie Danske (in Danish). May 1944. p. 7. Retrieved 18 November 2014. ^ a b Pais 1991, p. 497. ^ Bohr, Niels (9 June 1950). "To the United Nations (open letter)". Impact of Science on Society. I (2): 68. Retrieved 12 June 2012. • Bohr, Niels (July 1950). "For An Open World". Bulletin of the Atomic Scientists. 6 (7): 213–219. doi:10.1080/00963402.1950.11461268. Retrieved 26 June 2011. ^ Pais 1991, pp. 513–518. ^ Craig-McCormack, Elizabeth. "Guide to Atoms for Peace Awards Records" (PDF). Massachusetts Institute of Technology. Retrieved 28 February 2013. ^ Michon, Gérard P. "Escutcheons of Science". Numericana. Retrieved 13 March 2017. ^ a b Wheeler 1985, p. 224. ^ "Bohr crest". University of Copenhagen. 17 October 1947. Retrieved 16 March 2007. ^ Weisskopf, Victor (July 1963). "Tribute to Niels Bohr". CERN Courier. 2 (11): 89. ^ "Niels Bohr". CERN Courier. 2 (11): 10. November 1962. ^ "History of the Niels Bohr Institute from 1921 to 1965". Niels Bohr Institute. Retrieved 28 February 2013. ^ Reinhard, Stock (October 1998). "Niels Bohr and the 20th century". CERN Courier. 38 (7): 19. ^ a b c "Niels Bohr". Soylent Communications. Retrieved 21 October 2013. ^ "Niels Bohr – The Franklin Institute Awards – Laureate Database". Franklin Institute. Retrieved 21 October 2013. ^ "N. H. D. Bohr (1885–1962)". Royal Netherlands Academy of Arts and Sciences. Retrieved 21 July 2015. ^ Cockcroft, J. D. (1963). "Niels Henrik David Bohr. 1885–1962". Biographical Memoirs of Fellows of the Royal Society. 9: 36–53. doi:10.1098/rsbm.1963.0002. ^ "500-krone banknote, 1997 series". Danmarks Nationalbank. Archived from the original on 25 August 2010. Retrieved 7 September 2010. ^ Klinglesmith, Daniel A., III; Risley, Ethan; Turk, Janek; Vargas, Angelica; Warren, Curtis; Ferrero, Andera (January–March 2013). "Lightcurve Analysis Of 3948 Bohr and 4874 Burke: An International Collaboration" (PDF). Minor Planet Bulletin. 40 (1): 15. Bibcode:2013MPBu...40...15K. Archived from the original (PDF) on 3 June 2013. Retrieved 28 February 2013. ^ "Names and symbols of transfermium elements (IUPAC Recommendations 1997)". Pure and Applied Chemistry. 69 (12): 2472. 1997. doi:10.1351/pac199769122471. Aaserud, Finn (2006). Kokowski, M., ed. Niels Bohr's Mission for an 'Open World' (PDF). Proceedings of the 2nd ICESHS. Cracow. pp. 706–709. Retrieved 26 June 2011. Aaserud, Finn; Heilbron, J. L. (2013). Love, Literature and the Quantum Atom: Niels Bohr's 1913 Trilogy Revisited. Oxford: Oxford University Press. ISBN 978-0-19-968028-3. Bohr, Niels (1985) . "Nobel Prize Lecture: The Structure of the Atom (excerpts)". In French, A. P.; Kennedy, P. J. Niels Bohr: A Centenary Volume. Cambridge, Massachusetts: Harvard University Press. pp. 91–97. ISBN 978-0-674-62415-3. Bohr, Niels (1985) . "The Bohr-Einstein Dialogue". In French, A. P.; Kennedy, P. J. Niels Bohr: A Centenary Volume. Cambridge, Massachusetts: Harvard University Press. pp. 121–140. ISBN 978-0-674-62415-3. Favrholdt, David (1992). Niels Bohr's Philosophical Background. Copenhagen: Munksgaard. ISBN 978-87-7304-228-1. Faye, January (1991). Niels Bohr: His Heritage and Legacy. Dordrecht: Kluwer Academic Publishers. ISBN 978-0-7923-1294-9. Gowing, Margaret (1985). "Niels Bohr and Nuclear Weapons". In French, A. P.; Kennedy, P. J. Niels Bohr: A Centenary Volume. Cambridge, Massachusetts: Harvard University Press. pp. 266–277. ISBN 978-0-674-62415-3. Heilbron, John L. (1985). "Bohr's First Theories of the Atom". In French, A. P.; Kennedy, P. J. Niels Bohr: A Centenary Volume. Cambridge, Massachusetts: Harvard University Press. pp. 33–49. ISBN 978-0-674-62415-3. Heisenberg, Elisabeth (1984). Inner Exile: Recollections of a Life With Werner Heisenberg. Boston: Birkhäuser. ISBN 978-0-8176-3146-8. Hilberg, Raul (1961). The Destruction of the European Jews. 2. New Haven, Connecticut: Yale University Press. ISBN 978-0-300-09557-9. Hund, Friedrich (1985). "Bohr, Göttingen, and Quantum Mechanics". In French, A. P.; Kennedy, P. J. Niels Bohr: A Centenary Volume. Cambridge, Massachusetts: Harvard University Press. pp. 71–75. ISBN 978-0-674-62415-3. Jammer, Max (1989). The Conceptual Development of Quantum Mechanics. Los Angeles: Tomash Publishers. ISBN 978-0-88318-617-6. OCLC 19517065. Jones, R . V. (1978). Most Secret War. London: Hamilton. ISBN 978-0-241-89746-1. OCLC 3717534. Jones, R. V. (1985). "Meetings in Wartime and After". In French, A. P.; Kennedy, P. J. Niels Bohr: A Centenary Volume. Cambridge, Massachusetts: Harvard University Press. pp. 278–287. ISBN 978-0-674-62415-3. Kennedy, P. J. (1985). "A Short Biography". In French, A. P.; Kennedy, P. J. Niels Bohr: A Centenary Volume. Cambridge, Massachusetts: Harvard University Press. pp. 3–15. ISBN 978-0-674-62415-3. Kieler, Jørgen (2007). Resistance Fighter: A Personal History of the Danish Resistance. Translated from the Danish by Eric Dickens. Jerusalem: Gefen Publishing House. ISBN 978-965-229-397-8. Kragh, Helge (1985). "The Theory of the Periodic System". In French, A. P.; Kennedy, P. J. Niels Bohr: A Centenary Volume. Cambridge, Massachusetts: Harvard University Press. pp. 50–67. ISBN 978-0-674-62415-3. Kragh, Helge (2012). Niels Bohr and the quantum atom: the Bohr model of atomic structure, 1913–1925. Oxford: Oxford University Press. ISBN 978-0-19-965498-7. OCLC 769989390. Medawar, Jean; Pyke, David (2001). Hitler's Gift: The True Story of the Scientists Expelled by the Nazi Regime. New York: Arcade Publishing. ISBN 978-1-55970-564-6. MacKinnon, Edward (1985). "Bohr on the Foundations of Quantum Theory". In French, A. P.; Kennedy, P. J. Niels Bohr: A Centenary Volume. Cambridge, Massachusetts: Harvard University Press. pp. 101–120. ISBN 978-0-674-62415-3. Powers, Thomas (1993). Heisenberg's War: The Secret History of the German Bomb. New York: Knopf. ISBN 978-0-316-71623-9. Richardson, W. Mark; Wildman, Wesley J., eds. (1996). Religion and Science: History, Method, Dialogue. London, New York: Routledge. ISBN 978-0-415-91667-7. Rife, Patricia (1999). Lise Meitner and the Dawn of the Nuclear Age. Boston: Birkhäuser. ISBN 978-0-8176-3732-3. Stadtler, Bea; Morrison, David Beal; Martin, David Stone (1995). The Holocaust: A History of Courage and Resistance. West Orange, New Jersey: Behrman House. ISBN 978-0-87441-578-0. Stewart, Melville Y. (2010). Science and Religion in Dialogue, Two Volume Set. Maiden, Massachusetts: John Wiley & Sons. ISBN 978-1-4051-8921-7. Thirsk, Ian (2006). De Havilland Mosquito: An Illustrated History, Volume 2. Manchester: MBI Publishing Company. ISBN 978-0-85979-115-1. The Conferences at Quebec 1944. Foreign Relations of the United States. Washington, D.C.: U.S. Government Printing Office. 1972. OCLC 631921397. Wheeler, John A. (1985). "Physics in Copenhagen in 1934 and 1935". In French, A. P.; Kennedy, P. J. Niels Bohr: A Centenary Volume. Cambridge, Massachusetts: Harvard University Press. pp. 221–226. ISBN 978-0-674-62415-3. The Coins and Banknotes of Denmark (PDF). Danmarks Nationalbank. 2005. ISBN 978-87-87251-55-6. Archived from the original (PDF) on 23 May 2011. Retrieved 7 September 2010. Aaserud, Finn (February 2002). "Release of documents relating to 1941 Bohr-Heisenberg meeting". Niels Bohr Archive. Archived from the original on 21 October 2012. Retrieved 2 March 2013. Feilden, Tom (3 February 2010). "The Gunfighter's Dilemma". news.bbc.co.uk. Retrieved 2 March 2013. Bohr's researches on reaction times. Vilhjálmsson, Vilhjálmur Örn; Blüdnikow, Bent (2006). "Rescue, Expulsion, and Collaboration: Denmark's Difficulties with its World War II Past". Jewish Political Studies Review. 18: 3–4. ISSN 0792-335X. Retrieved 29 June 2011.